SPRINGFIELD, Mass. – There’s a reason that Cambridge Rindge & Latin came into Saturday’s Division 1 State Final riding a 44 game winning streak. The Falcons’ talent was on full display, and they got the most out of their size advantage to pick up their 45th straight win and second consecutive state championship with a 70-43 win over Franklin. While the Panthers kept close for the first quarter, Cambridge built a double-digit lead going into the halftime break and never looked back. “It wasn’t our best game, but [Cambridge] does a lot to make that happen,” said Franklin head coach CJ Neely. “This wasn’t like the teams we had played during the year, when you drive to the lane, you get some space, all of a sudden there’s a 6’9 guy there cleaning everything up. It’s hard, he’s a good player and a difference maker for those guys in the interior. The 6’9 player that Neely referenced is Cambridge senior Dimon Carrigan, who proved to be the biggest difference maker. Beyond his game-high 21 points and 11 rebounds, Carrigan notched an impressive nine blocks and altering plenty of other shots, making it difficult for the Panthers to get anything inside. Franklin freshman Chris Edgehill scored seven of his team-high 12 points in the opening frame to help the Panthers keep pace with the Falcons. Edgehill’s step back three gave Franklin a 5-4 lead three minutes in and a three point play from sophomore Jalen Samuels (eight points, eight rebounds, three blocks) put the Panthers up 8-6. But Cambridge’s Malik Brandao-Correia drained a three with a minute to play and Carrigan scored inside for a 17-12 lead after one. 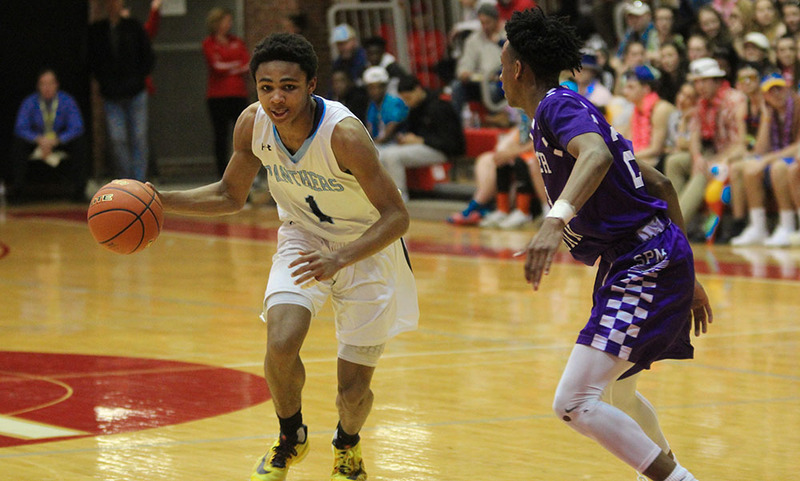 Although Franklin kept it close in the first, its offense stalled in the second quarter, managing just six points on 2/11 shooting from the field. Cambridge rattled off a 10-3 run over the first six and a half minutes of the second quarter. Samuels hit one free throw with 5:44 to play in the first half, but didn’t score again until Matt Elias drained a three with 1:15 to go. In that stretch the Panthers had an uncharacteristic seven turnovers. Also in that time span, Franklin big man Connor Peterson — the Panthers’ counterpart for Carrigan — came back in after picking up two fouls in the first two minutes of the game. But his second stint was cut short because of his third foul. Cambridge extended its lead to 20 points just three minutes into the third quarter but the Panthers were able to claw back into the game. Edgehill hit back to back buckets, the latter turning into a conventional three point play. Samuels then added two free throws to cut it to 13. Cambridge committed an offensive foul, Franklin broke the press and had a transition three attempt to cut it to 10, but the shot was short. Cambridge then finished the third quarter with a 6-0 run to go up 49-30. The Falcons started the fourth with four straight points to go up 53-30. Franklin was unable to shrink the deficit the rest of the way. “The kids have nothing to hang their heads about, they’ve gone further than any other team has in Franklin school history,” Neely said. “I told them ‘you’re going to put a banner up in the gym for being a sectional champion and you got to play in a state final. You’re probably the best Franklin team that;’s ever played. So there’s a lot to be proud of. We couldn’t get it done tonight but I think the true state champion won tonight, I think the best team in the state won. We were up for the challenge but I don’t think we were ready to play at this level. Peterson finished with six points, Mahon added five points and senior Josh Macchi hauled in five boards. While the Panthers will have to find a replacement for Macchi and sharpshooter Connor Goldstein, two of four graduating seniors along with James Hanlon and Michael Doherty, the future does look bright with four starters set to return for the 2017-2018 season. Franklin boys basketball finishes the season 22-5. WORCESTER, Mass. – You had to see it to believe it. After Springfield Central’s Maickel DeJesus made two free throws to put the Eagles up 51-43 with just 20 seconds left in the game, fans started filing out of the DCU Center in Worcester. It’s a move they’ll likely regret. On the ensuing Franklin possession, freshman Chris Edgehill (12 points) hit a an off balance three from the corner to cut the lead to 51-46, and then DeJesus immediately stepped out of bounds receiving the inbounds pass. Edgehill got fouled before Franklin even inbounded the ball, and hit both shots and then Springfield Central tipped their inbounds pass out of bounds after initially being deflected by Franklin’s Paul Mahon. Down three with eight seconds left, Franklin went right back to Edgehill, who buried a three from almost the exact same spot as his first one to tie the game at 51 all. With no timeout called from either side, Springfield Central hurried down the court to try to win it, and after the initial attempt by De Jesus missed, Jashidi Pressley was there for the follow and hit a floater to give Springfield Catholic what appeared to be a 53-51 win, but while the Eagles stormed the court and pig piled on top of Pressley, the referees conferred and waved off the basket, sending the game to overtime. “We had to hustle the guys in and be like, look we got a game to play, they can be excited but we have to focus the next four minutes if we want to get it done,” Franklin coach CJ Neely said about the crazy finish. In overtime, Jashidi Pressley (nine points) started out the scoring by hitting two free throws, but from that point on it was pretty much all Franklin, as Jalen Samuels answered back with a three and after a stop on the other end, Connor Peterson’s putback put the Panthers up 56-53 with a minute left to play. Ahmad Conner then missed two free throws for Springfield, and Hason Ward went one for two at the line to cut the lead to 56-54 with 24 seconds left, but Franklin captain Paul Mahon — in his first game back from a concussion (12 points, seven rebounds off the bench) — iced the game with two free throws and a defensive rebound down the other end. Peterson hit two free throws with just six seconds left, and those two would be the final points of the game as Franklin went on to win 60-54 to clinch their place in the D1 State Championship game Saturday against Cambridge Rindge and Latin. “I actually channelled my inner Julian Edelman [at the end of regulation], I said it’s gonna be a hell of a story, and we just kept saying that at every time out, that it’s gonna be a hell of a story,” Neely said. Heading into the 4th quarter, with both teams tied at 34, Springfield raced out to a 40-35 lead, but Franklin senior Josh Macchi (eight points, seven rebounds) had back to back conventional three point plays, putting Franklin up 41-40. Springfield Central responded with a 9-0 run to grab 49-41 behind strong play from Maikel DeJesus (18 points, including eight in the fourth quarter) and Justin Feleciano (16 points, five in the fourth). It was a strong defensive effort from both sides as well, as Hason Ward had six blocks for Springfield Central and Franklin held a high scoring Central team (they put up 100 points in a game twice this year) to just 54 points, their season low, an even more impressive feat considering the game went into overtime. As if Edgehill’s heroics at the end of regulation could get even more impressive, he wasn’t playing at 100%. “He woke up yesterday with a 102 degree fever, told me, ‘don’t worry, i’ll be good’ and he always seems to make big plays in big moments, he’s a big time player,” Neely said on Edgehill. The third quarter were a back and forth affair, as Springfield Central’s 6-0 lead to start the game would be the largest either team would hold throughout the first three frames. DeJesus scored the first bucket of the game on a fast break immediately after SC won the tip, and Jashidi Pressley (nine points) would score on the next Springfield possession, followed up by another DeJesus bucket. Connor Peterson (15 points) then hit two free throws as part of a nine point first quarter for him which kept the Panthers in the game, as they trailed 14-13 after one. In the second quarter, backup guard Justin Feleciano would be the only source of offense for Springfield Central, as he had eight of his 16 points in the frame, and with Peterson battling foul trouble, other guys had to step up and they did, as four points from Mahon, three from Samuels (ten points), and two from Macchi would bring both teams to a 22-22 deadlock at the half. The third quarter too would end at a 34-34 stalemate, as Mahon paced Franklin with six in the quarter off of two threes, and DeJesus would drop in six of his own in the 3rd as the two guards battled back and forth for much of the quarter. 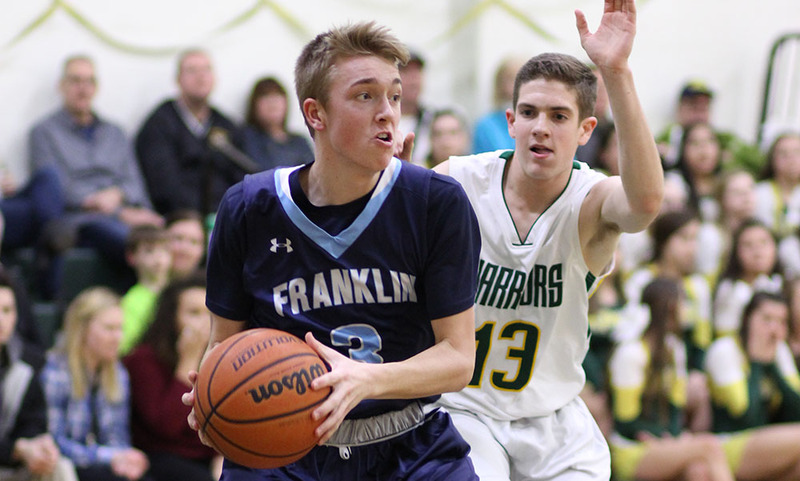 For Franklin boys basketball, they now have to look ahead to Cambridge, the defending D1 State Champs. Cambridge went 22-0 in the regular season and beat Lawrence, Lowell, Central Catholic, and Needham to advance to the state finals this year. #1 Franklin, 60 vs. #1 Springfield Central, 54 – Final (OT) – With just under 16 seconds to play, Franklin trailed 51-43. By the end of regulation, the Panthers had pulled off the miraculous comeback to tie the game and send it into overtime. Freshman Chris Edgehill sandwiched a pair of three pointers around two free throws while Springfield Central had a pair of turnovers on inbounds plays in between. In overtime, sophomore Jalen Samuels hit a three to put Franklin up 54-53 and Connor Peterson converted an offensive rebound to make it 56-53. Both Peterson and Paul Mahon (12 points) hit free throws down the stretch to ice the game. Franklin advances to the D1 State Championship on Saturday. 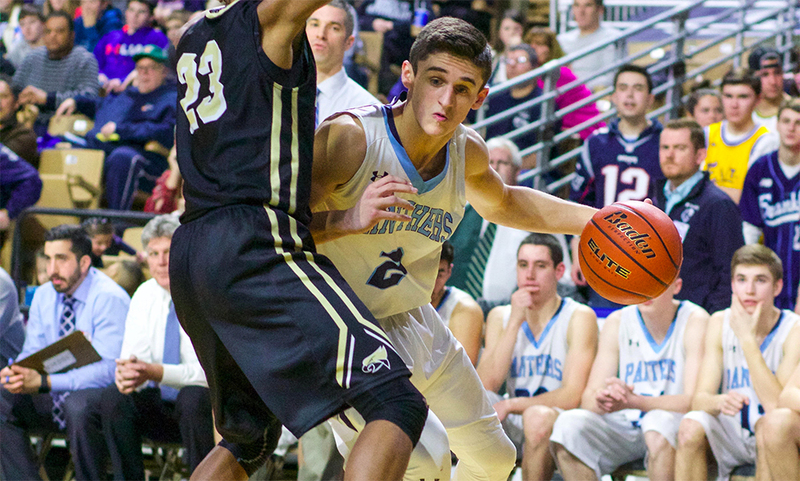 The Panthers will play North champion Cambridge at the MassMutual Center on Saturday. #14 Canton, 1 vs. #7 Westwood, 0 – Final – Junior Kendra Farrelly scored the lone goal of the game, finding the back of the net in the second period to lead the Bulldogs. Canton will play #1 Notre Dame Academy on Sunday at the TD Garden in the Division 2 State Championship. WORCESTER, Mass. 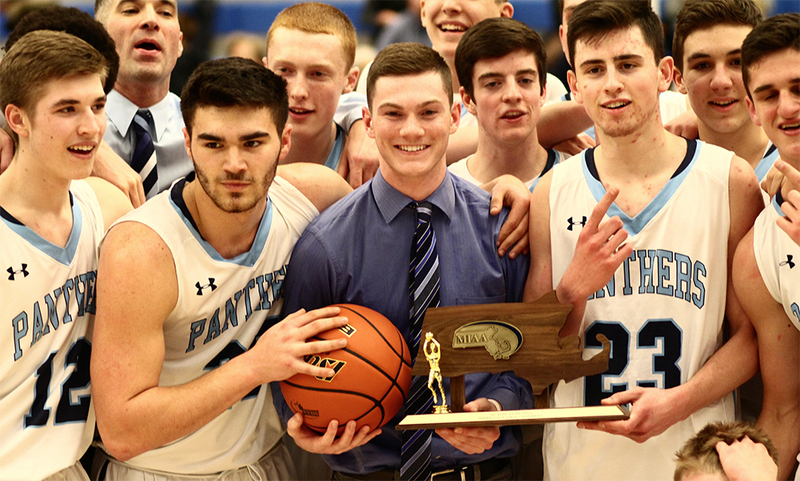 – For the past three seasons, the Franklin Panthers have had their season come to an end at the hands of St. John’s Shrewsbury. The Panthers clawed back from an early deficit, took their first lead in the fourth quarter and came up with a big defensive stop in overtime to get the 67-64 win to claim the program’s first ever D1 Central Sectional title. Franklin will play Springfield Central (West sectional champion) on Tuesday, March 14th at the DCU Center at 7:30. After missing on a chance at the end of regulation, the Panthers headed to overtime with the Pioneers tied at 60-60. SJS took the early 62-60 lead before Macchi (18 points, 11 rebounds) hauled in an offensive rebound and converted the put back halfway through the overtime period. Franklin grabbed a defensive rebound after a missed three from the Pioneers, setting up Panther freshman Chris Edgehill (16 points) for a big moment. The rookie took a pass from Macchi, pulled up and drained a three late in the shot clock, giving Franklin 65-62 edge with just over a minute to play. Sophomore Jalen Samuels (15 points, eight rebounds, three blocks) came away with a steal but Edgehill’s transition three came up empty with 40 seconds to play. SJS answered with a pair of free throws to get within one and then fouled the Panthers. However, Franklin missed the front end of a one-and-one to give the Pioneers possession, down 65-64, with 13.8 left. Samuels came up with a big block at the rim when St. John’s drove to the basket to try to take the lead. On the ensuing play, with 5.9 seconds to play, the inbounds pass went over the head of its intended target, with Edgehill tracking down the loose ball. He was fouled with 1.4 to play. The freshman then hit both free throws and SJS’s last second chance – a heave to just over half court and a turnaround three – came up short, giving the Panthers the win. While the finish was want Franklin wanted, the start of the game was far from ideal for the Panthers. St. John’s Shrewsbury raced out to a 9-0 lead just over two and a half minutes into the contest. Franklin was able to cut the deficit to five — 16-11 — by the end of the first quarter. The Pioneers quickly stretched the lead back to nine early in the second quarter (20-11) but a 10-3 run from Franklin brought Franklin right back into the contest (23-21) midway through the second quarter. However, SJS rattled off a 7-0 run to get back up 30-21. Franklin hit back with a 6-0 run to make it a one possession game but an errant pass was picked off and SJS converted a layup at the halftime buzzer to take a 32-27 lead. The Panthers trailed by either three or five points for the majority of the third quarter. Finally, with two minutes to play a drive from Samuels tied the game at 40. Hunter Gorgas put SJS back ahead but Connor Peterson (eight points) responded with a basket of his own. Robert Duquette drained a three to put the Pioneers back ahead but Franklin senior James Hanlon came off the bench to score off a nice post move, cutting the deficit to one (45-44) heading into the fourth. Gorgas hit two free throws but Edgehill responded with a triple to tie the game early in the final period. The Panthers’ first lead came with 6:35 to play in regulation on a three point play from Macchi, who went up and under and converted while being fouled. He hit the free throw to make it 50-47. SJS’s Alex Bradley cut it to one but Peterson got one right back. After a miss from Franklin, Steven Bucciaglia drained a three to tie the game with four minutes to play. Two free throws from Edgehill preceded a missed three from SJS and then two points from Peterson to make it 56-52. Tyler Mola (22 points) responded with traditional three point play for the Pioneers, who got the ball back after taking a charge. Mola then drained a three with just over two minutes to play to put SJS back up 58-56. Franklin missed on the other end but Macchi was there for the offensive rebound and hit the put back to tie the game at 58. Mola once again came up big for the Pioneers, hitting a tough layup to make it 60-58. Franklin had a turnover but forced a double dribble by the Pioneers to get the ball back. Samuels used a strong take to the left to tie the game with just under a minute to play. The duo of Edgehill and Samuels combined for 28 points in Franklin’s playoff opening win over Acton-Boxboro, 20 points against St. Peter Marian and then 31 points in the section final against the Pioneers. Edgehill, who started the season on the bench, was quick to credit a teammate for how far he’s come this season. 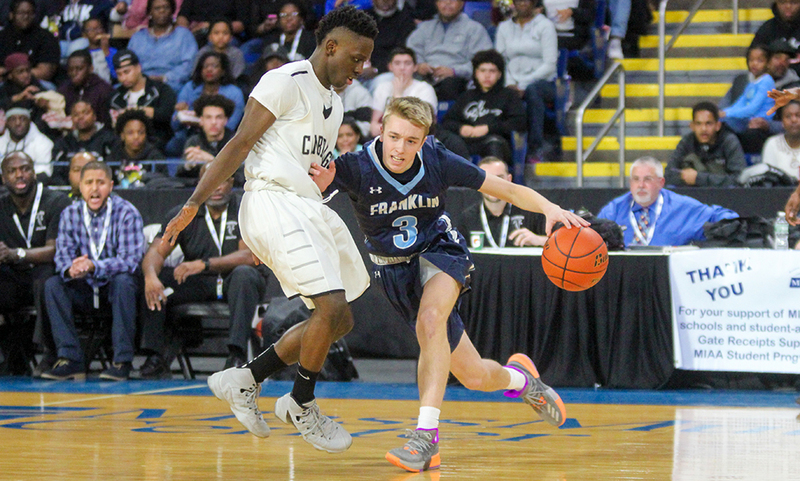 Franklin boys basketball (21-4 overall, 21-2 tournament record) will tip off against Springfield Central on Tuesday at 7:30 at the DCU Center.